AquaOrganic Omnivorous Fish Feed is made entirely from non-GMO, USDA certified organic ingredients, and contains no fish meal, soy or terrestrial animal parts. And the best news is that nothing was sacrificed in the quality of this feed. AquaOrganic fish feed was formulated by a team of experts in aquaculture, organic pet food, and aquaponics to create a fish food that feeds your fish as nutritiously as they feed you! Available in 5, 10, 20 and 50 pound sizes. AquaOrganic feed is currently only offered in one size, but is easily broken down in a food processor, blender or with a mallet for very young fish. 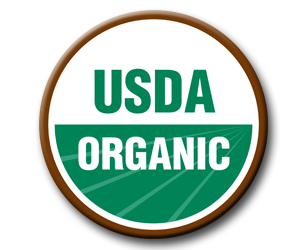 Contains certified organic agricultural products or ingredients that conform to the NOP’s national list of materials acceptable for organic agriculture production. No GMO’s, no fish meal, and no soy! Can be easily be crushed to a size that is suitable for fry and fingerlings. Organic Canola Meal, Organic Sesame Seed Meal, Organic Corn, Organic Linseed Meal, Dicalcium Phosphate, Calcium Carbonate, Lactobacillus Acidophilus Fermentation Product, Organic Wheat Middlings, Organic Dried, Kelp, Reed-Sedge Peat, Choline Chloride, Ferrous Sulfate, Manganese Sulfate, Zinc Oxide, Sulfur, Magnesium Oxide, Copper Sulfate, Calcium Pantothenate, Thiamine, Biotin, Sodium Selenite, Ethylenediamine Dihydriodide, Vitamin B12, Cobalt Carbonate, Organic Dried Tomato Pomace, Attapulgite Clay, Diatomaceous Earth, Monosodium Phosphate, Organic Apple Cider Vinegar, Organic Dried Whole Milk, Organic Aloe Vera Gel Concentrate, Organic Potato Starch, Organic Dehydrated Eggs, Yeast Culture, Organic Lecithin, Potassium Chloride, Niacin, Sodium Sulfate, Copper Choline Citrate Complex, Ferric Choline Citrate Complex, Zinc Sulfate, Zinc Amino Acid Complex, Manganous Oxide, Manganese Amino Acid Complex, Ascorbic Acid, Vitamin A Acetate, Vitamin D3, Natural Source of Vitamin E (d-alpha Tocopheryl acetate), Riboflavin, Pyridoxine Hydrochloride, Carotene, Folic Acid, Cobalt Sulfate, Cobalt Choline Citrate Complex, Lactobacillus Acidophilus, Lactobacillus Casei, Bifidobacterium Thermophilum, Enterococcus Faecium, Potassium Citrate, Citric Acid, Calcium Sulfate, Magnesium Sulfate, Silicon Dioxide, Organic Sugar, Organic Sources of (Cayenne Pepper, Peppermint, Fabaceae Poaceae, Garlic, Parsley, Dandelion Root Extract, Licorice, Orange Peel Extract, Elder Flowers, Dandelion Extract, Ginger Extract, German Chamomile, Lemon Grass Extract, Thyme, Hops Extract, Sweet Fennel Extract, Sweet Basil, Sage, Cloves), Natural Antioxidants. This entry was posted on Wednesday, January 9th, 2013 at 5:23 PM	and is filed under Hydroponics / Aquaponics. Both comments and pings are currently closed. We are beginning to raise Tilapia in large quantity (20,000+) and are interested in organic. The concern we have is that we understand that organic feed with NO fish meal results in slower growth rates than with the traditional fish meal.